Niranye is an Altmer thief living in Windhelm. She has a stall in the market where she buys and sells goods of all kinds. She was once an associate of the Thieves Guild before they fell on hard times and their fence network collapsed. 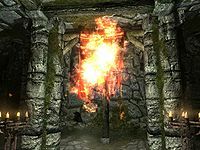 Completing the guild's Windhelm special job, Summerset Shadows, will get her to resume dealing with them as a fence again. Niranye starts her day at 6am with a hearty breakfast. With her hunger now satiated, she will head to her stall at 8am. Niranye will remain at work for the next twelve hours, offering her services to all passersby. After closing her stall for the day, she will head to the New Gnisis Cornerclub to spend the rest of the day. She will finally return home to her bed at 2am. At 6am, she will get out of bed to start a new day. Niranye wears a set of merchant's clothes along with a pair of boots. She carries the key to her house, a Darkwater Pit key, and a selection of common loot and gold. In combat, she relies on a leveled dagger of the best possible quality. Approaching Niranye may have her comment on the current war's effect on the convenience of traversing the countryside: "I'd travel more, but who wants to deal with all the soldiers these days?" She will additionally recommend you visit Candlehearth Hall if you are looking for an inn, even though her inn of choice is the cornerclub: "If you're looking to get a drink, Candlehearth Hall's got warm fires and strong ale." Visiting her before 8am but after 6pm will have her tell you to visit her during her working hours, "Come see me in the marketplace tomorrow. You won't find better prices in all of Eastmarch." or that her prices are firm: "I don't haggle. If you want a lower price, look elsewhere." 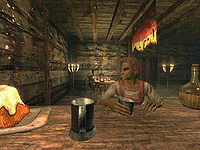 Asking Niranye how long she has lived in Windhelm will have her reveal she is an immigrant from the Altmer homeland, the Summerset Isles: "Just got here from the Summerset Isles. Lots of opportunity in Skyrim." Questioning her about how the Nords treat her compared to the Dunmer will have her explain her philosophy in getting past the native's bigotry: "It was difficult at first. The Nords of this city are, at best, suspicious of outsiders. But in time, I made the right friends and proved myself useful enough that they don't give me trouble anymore. The dark elves are too proud and naive to understand the way things truly are, and so they continue to dwell in that slum." 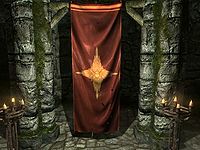 Should the Imperial Legion capture Windhelm, Niranye will talk about how this has affected her business affairs if asked if the conquest of her city has disrupted her efforts: "In some ways, yes, but there is often opportunity in chaos. When a new government takes charge, records can be lost, taxes can be forgotten and laws aren't always enforced. The new guards are often too busy learning their responsibilities to notice a few smuggled goods or minor robberies. Not that I'd ever get involved in any of those kinds of things, of course." When ending a conversation with her, she may politely say: "Thank you for your custom." She may also subtly size you up as a mark, ending the conversation with: "I'll see you again soon, I hope." 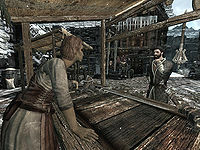 Should you complete five Thieves Guild Special Job Quests in Windhelm, you will be tasked to meet with Torsten Cruel-Sea to help him avenge his daughter's death, and destroy a rival criminal organization by the name of the Summerset Shadows. Speaking to Torsten will have him tell you the story of how a thief murdered and robbed his daughter Fjotli. While he found and killed the murderer in revenge, a family heirloom that was on his daughter's person is still missing. He tasks you with finding and retrieving the locket. To get you started, he points you in the direction of Niranye: "The only name I have is Niranye. Has a house right here in Windhelm. That's where you should begin looking." "Fjotli... Fjotli... Where have I heard that name? Oh, of course, the poor girl who was murdered. Such a beautiful young thing... a tragedy to be certain." "Drop the act. I know you're involved in her death." "How dare you! You're accusing me of taking part such a... such a... heinous act? I should have you arrested for even suggesting such a thing!" Next time you wish to accuse someone of a crime, I suggest you obtain proof! Choosing the third option will allow you to fight, and kill Niranye. On her corpse will be a letter leading you to Uttering Hills Cave to continue the quest. Should you choose the last option, you will be given a chance to obtain the proof she mentioned. By breaking into her home, and searching the southern wall of the eastern room, you will discover a hidden panel that opens up a staircase to her basement. 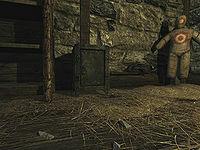 Inside the basement is a safe that contains a first and second letter from the leader of the Summerset Shadows, Linwe, addressed to Niranye about the locket. Confronting her again with the notes in your inventory will have her say: "What do you want now? You still hurling baseless accusations?" Revealing the stolen letters to her will allow you to advance forward in the quest as you would if you had persuaded or intimidated her before. "Now, just a moment. Let's think about this... you know, discuss it like two rational people." "Look, I had no choice. They're crazy... I could be killed!" "It's a guild of Altmer thieves, they call themselves the Summerset Shadows. Their leader, Linwe, he's the worst of the lot. He steals valuables from the dead." "You mean he murders his marks." "No! Linwe prefers stealing from the deceased. Digs up the corpses, breaks into the Hall of the Dead... He even stole that locket right off that poor murdered girl's body... or what was left of it." "I used to fence for the Thieves Guild in Skyrim a long time ago. When Linwe moved into the area, he contacted me and said if I didn't fence for them, he'd kill me." "Tell me where Linwe's hiding." "If I tell you, you need to promise not to kill me. I'd prove to be quite an asset to the Thieves Guild... I'm one of the best fences in Skyrim." "I'm not going to kill you. That's not our way." She will then reveal the location of the Summerset Shadow's headquarters: "Linwe is holed up at a place called Uttering Hills Cave. He's got his entire Guild there, so be careful. After you're done with all this, come back anytime, and I'll make good on my end of the bargain." You will now have the option to ask for the truth about what happened to Fjotli, to which she will reveal she truly does not know the truth about the murder: "I don't know. Rumor has it that she was murdered... butchered by a madman. I really try and stay out of such things. Torsten might think Linwe or myself are responsible for Fjotli's death, but I can assure you nothing could be further from the truth." Ending the conversation with her will have her apologize for her previous behavior: "I'm sorry I mislead you. Return when this is over, and we'll talk about my involvement in the Thieves Guild." Once you complete the quest and destroy the Summerset Shadows, you can ask Niranye how her business is going now that she is back in the ranks of the Guild: "I've been setting up some open trading with Tonilia back at the Guild in Riften, and it's proven to be quite profitable. There's been no word from the remnants of the Summerset Shadows, so I'm assuming you either eliminated all of them or they've fled Skyrim. Everything seems to be working out nicely, wouldn't you agree?" As promised, she will also offer you fencing services, which includes new greetings appropriate for your new business relationship: "So, you've come to see me to sell or to buy? Hm?" "I've got all sorts of interesting things for you to buy, and I assure you they're of the finest quality." "If you've got the time to sell, I've got the time to buy." "Let's see what you have for me today. Something simple to turn around for a profit I trust." 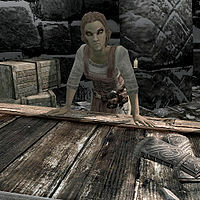 As she is a loyal member of the Thieves Guild once more, getting into trouble with the Guild will have her deny you service, and greeting you by saying: "In trouble with the Guild, eh? Well, looks like we won't be trading merchandise until you smooth it over." Ending conversations will also bring a new response from her: "Hurry back... and bring more merchandise." Niranye: "Captain Lonely-Gale, it's always a pleasure to see you. In fact, I'm glad you're here. There's something I'd like to ask you." Lonely-Gale: "A pleasure to see you as well, Niranye. What can I do for you?" Niranye: "I was wondering if you still had many associates in the shipping profession. I have a business proposition for any sailors who might be looking to make a few extra septims." Lonely-Gale: "If that business proposition includes smuggling, forget it. The sailors I know are plenty good at finding trouble without any help from you." Niranye: "You're such a wet blanket, captain. Can't a girl have a little fun from time to time?" This is the merchandise found in Niranye's standard merchant chest, available when she is at her merchant stall. 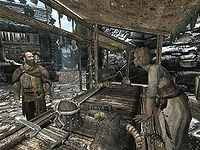 These items are only available if purchased from the merchant; they cannot be pickpocketed or stolen. They are restocked every two days. This is the merchandise found in Niranye's merchant chest when she is in her house acting as a fence. 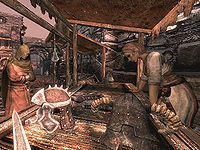 These items are only available if purchased from the merchant; they cannot be pickpocketed or stolen. They are restocked every two days. The greeting where she says: "Come see me in the marketplace tomorrow. You won't find better prices in all of Eastmarch." is worded in such a way that it appears to have been intended for use when she was not working, but she may say it during the last two hours of her workday. The key to Niranye's safe is erroneously called Darkwater Pit Key (000d7772) and should not be confused with the key (0003bb13) by the same name found in Darkwater Pass. This page was last modified on 17 December 2017, at 16:44.